One of the most important gifts that we can give ourselves and our children is the knowledge and comfort that we are not alone. Through worship, study and tikkun olam, we affirm our support for each other. This participation and commitment, above all things, has sustained our Jewish heritage for almost 6,000 years. In true family tradition we envision full participation by every member, where each person will discover a meaningful role. At the same time, we recognize that Judaism is not “one size fits all”. Given the diversity of our members of various backgrounds and interests, we seek to offer an array of worship, education and activities for each member. Emeth offers you many paths to connect with Judaism and with other members of your Jewish community through common religious, social, or cultural interests. We strive to find a place for all–young families, professionals, teens, young adults and singles, retired members, interfaith families, and non-traditional households. All are cherished members of our community and we welcome you! 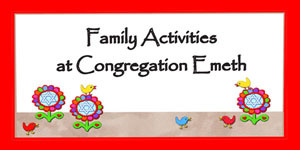 We hope you will take these opportunities to develop rewarding friendships with other members of your extended family at Congregation Emeth while enriching your connection with Judaism.